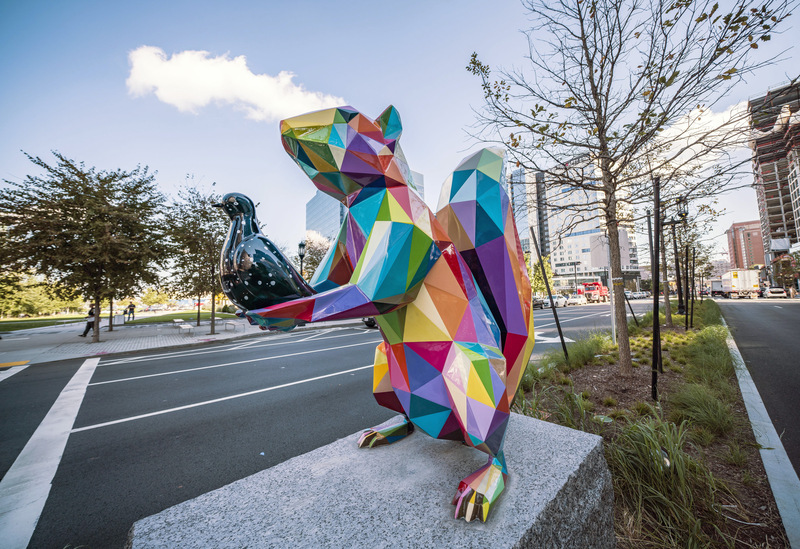 Seven towering sculptures comprised of brightly colored facets have recently landed on the streets of Boston, courtesy of Okuda San Miguel. The multi-disciplinary Spanish artist, best known for his colorful interventions in and on buildings around the world, installed the series of seven sculptures called Air Sea Land in Boston’s seaport corridor. Okuda’s creations range from eight to twelve feet tall, and include regional wildlife like deer and squirrels, while also integrating mythological elements like a scaly humanoid sea creature and a seagull with arms and legs. Air Sea Land which is Okuda’s largest public art project to date, was curated by Justkids. You can see more from Okuda on Instagram, and tour the pieces in the video below. Twenty years ago, the fortress city of Carcassonne in southern France was named a UNESCO World Heritage Site. In celebration of the important anniversary, Swiss artist Felice Varini (previously) was commissioned by France’s Centre des Monuments Nationaux to install a massive illusion of concentric yellow circles on the city’s border. The installation, titled “Concentric Concentric,” was installed this spring and will remain up through September, 2018.